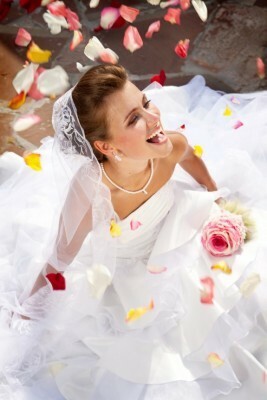 Forget the superstitions related to wearing pearl drop earrings or any other type of pearl jewelry on your wedding day! The idea that pearls would bring tears on your special day is just a myth! Since ancient times, pearls have been associated with wealth, social status, love, marriage, marital harmony and good fortune. Nowadays, wearing pearls is also a symbol of elegance and refined tastes. Take a look at our list of five gorgeous pearl drop earrings for your wedding if you seek to look smashing on the happiest day of your life! Are you aiming for a truly elegant, royal wedding? If you are a fan of U.K. icon Queen Elizabeth II or First Lady Jackie Kennedy, then you need these white freshwater pearl dangle earrings to go with your milk foam white dress. Why Should You Wear Them? The silver tops and caps are beautifully complemented by the luxurious shine of the pearls themselves. These earrings go great with other silver sterling accessories and jewelry you might want to wear. Style experts also recommend you get your wedding hair done in a gorgeous bun to let the drop pearl earrings shimmer and charm everybody. One of the greatest advantages of this type of earring is that the set can be worn after the wedding in more casual occasions. You can compliment any evening dress or even a power suit with them, adding softness, gentleness, smoothness and female charm to any outfit. You may desire a bridal party with less shiny glamor but with a sophisticated simplicity to turn you into a real Mikimoto woman. Such standard of perfect beauty can easily be achieved with these small white Akoya pearl drop earrings in a simple, yet outstanding gold montage. Such earrings don’t need much to turn all your heads around: they can make even the simplest bridal dress sparkle, in a symphony of elegance only true refined ladies can understand. They have an intrinsic power of covering all your accessorizing needs, so you can wear them and nothing else to light up any room you set foot in. Their perfect size and color mix can make them your favorite earrings at cocktail parties or board meetings as well. Remember that this “something old” item, in the shape of these legacy earrings, will be cherished by your daughter or granddaughter as one of the most important gifts received from her mother. These refined and textured pearl and diamond drop earrings will turn you into the superstar of your wedding, just like you deserve. They make a perfect combination of precious metals and stones since this AAA 14K yellow gold pearl earring set matches all personal fashion styles and all types of wedding parties. They are small enough to be worn together with other pieces of jewelry, but long enough to make a statement. These earrings can easily match your gold diamond wedding ring. They are what Queen Cleopatra would have worn, reminiscing of treasures that make ancient legends and adventure stories seem real. Given their versatility in color and texture (smooth pearl surfaces, sharp-shimmering diamond facets, sparkling yellow gold), they are a great option no matter the dress style you pick. They are the perfect choice for a vintage-style dress or a modern golden filigree designer’s work of art. Pearls have always had an enigmatic, fairy-tale side to them. They have been worn by men and women alike, they had wars inflicted, dangerous adventures started and entire societies changed and transformed. And they have also always kept their mystery and their power of fascination. If you want your wedding and your bridal attire to be remembered fifty years from now, you should pick this quality South Sea 14K yellow gold pearl earring set. They are the perfect accessory for a beach wedding in a sensational exotic landscape and they will definitely compliment your bronze tan. If you are planning a wedding party in the city, these seashells shaped tops and diamond accents earrings will bring the beach to you. They have a true fun side you can’t overlook, looking stylish and yet elegant, full of life and speaking about youth and joy of life. You can have your exotic island wedding anywhere in the world and look amazing if you combine the earrings with some Tiffany crystal clear diamonds and a Channel-signed type of dress. Some say that weddings and the color black have nothing in common. However, if you take a look at the latest wedding fashion and pearl drop earrings bridal trends, you will notice that a hint of black is no longer off limits. Wearing Tahitian black pearl drop earrings at your wedding means you are a powerful woman who cares less about conventions. These earrings feature a white gold snake-like twist, creating dimension and depth. Together with the small diamonds, the smooth surfaced pearls will make you stand out of the crowd, especially if your “something black” accessories include a black pearl ring or a white gold chain pendant. After the wedding, these earrings will go great with all your little black dresses. They will perfectly match a faux-fur outfit, a baroque-style ball or a casual cocktail party with friends. They also match any color you fancy in some season or another. From simple gray to sparkling silver attires, they will be that single, particular and outstanding add-on you will need. Pearls and weddings have at least one thing in common: they are both a woman’s dream come true. It doesn’t matter if you are into large pink cultured pearls for summer parties or into convoluted antique-style statement montages with sparkling white or golden pearls. You can pick the best pearl drop earrings to match your taste and your style at your own wedding to make sure you will live happily ever after. This entry was posted in PearlsOnly and tagged pearl drop earrings, wedding jewelry, white south sea pearls by PearlsOnly Team. Bookmark the permalink.